…a really good cup of tea. Since last night’s dinner was unexciting (potatoes, peas, broccoli, and pineapple, singly, not in combination) I thought you might enjoy this picture of a cup of tea. But wait! 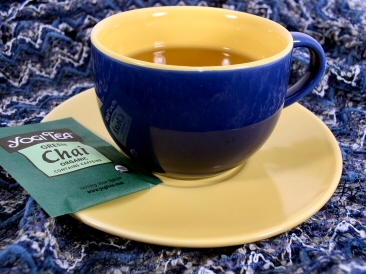 It’s not just any tea, it’s Yogi Green Chai, quite possibly my new favorite tea. More gingery than your regular Chai and less “green” tasting than other green teas, this tea is perfect for sipping in front of the fire on a cold afternoon. Oh, who am I kidding? I live in Mississippi and it’s been in the 60’s. I just drink it because it’s delicious!